This past Saturday Luke & I participated in the Color Run. I was beyond excited to participate as I've followed the run on Facebook, Twitter & Instagram & have loved seeing everyone's photos! I'm not much of a runner, but we always welcome new ways to stay in shape so we don't get burned out on the gym. It ended up being so much fun! We heard that there were over 15,000 runners, too! My favorite part of the event was the dance party at the finish festival when everyone thew their colors in the air! *I must add that the night before the race we were invited to a dinner put on by Chevrolet. They had their special Color Run Chevy Spark on display INSIDE the restaurant as well as their designer & a few representatives on hand to chat about Chevrolet's partnership with the Color Run. It ended up being such a fun evening filled with tasty drinks, beyond delicious food at Yakuza & some great conversation with the ladies from Chevrolet! Thanks so much for having us! that looks like so much fun! 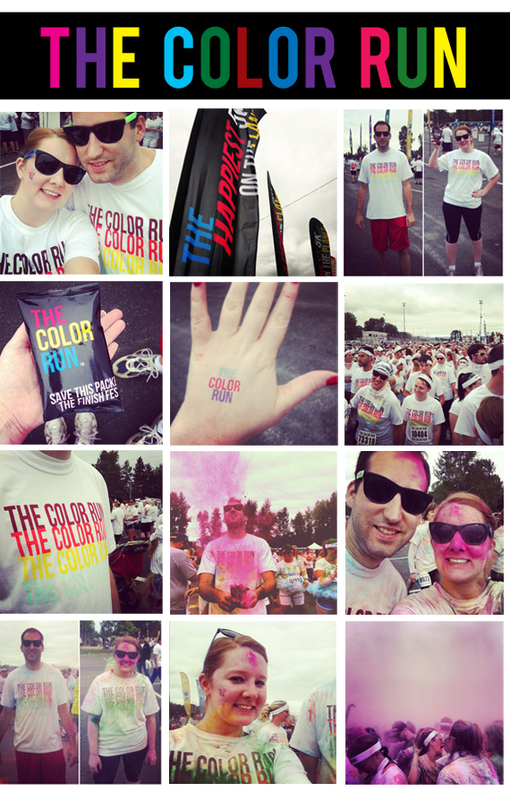 I'm in a fight with the Color Run right now. By the time we found out we were moving to Minneapolis, it was sold out. So I put my name on a list to be notified when more spots opened up. I never got an email, and the morning of the color run I randomly thought about it, went to the website, and saw that they had added another race earlier in the morning that still had plenty of tickets left! I could have gone. Rude.